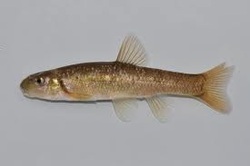 The Ruffe is generally a shoaling fish and can be found in fresh or brackish waters, in rivers, lakes and ponds although they seem to prefer slow moving rivers. They are most active at dusk or dawn feeding on insects, larvae, worms and small fry fish. The Orfe has found it's way into the UK as a decorative fish, frequenting Carp ponds and ornamental ponds in parks, where it can often be seen cruising underneath the surface in small shoals. It's main diet being insect larvae, worms and fallen insects. These tiny fish can be a bit of a pest when fishing with maggots as they shoal together and attack small baits. They are up to 2inches long and are brown/green on top with a dark line along the flanks. They are found in rivers, lakes, ponds and streams across Europe. 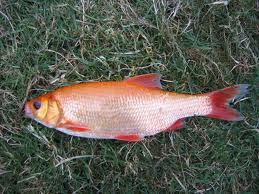 Some fisheries stock goldfish of all sorts in their commercial fisheries - a cheaper way to bulk up their stocks. They can range in size and colour, from brown through to blue, and all colours in between. 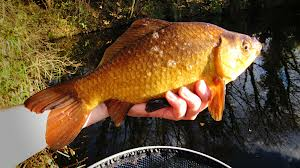 Brown goldfish are very often mistaken for crucian carp. To catch a goldfish or two, simply use the same tactics as you would when fishing for a carp of any size.